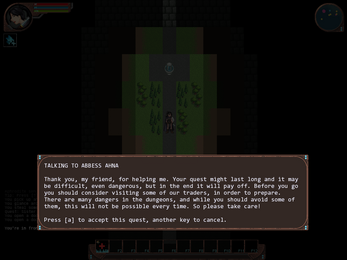 LambdaRogue: The Book of Stars is a complete roguelike role playing game, with unique features and story, distinct atmosphere and feel, and a user-friendly, but traditional interface. LambdaRogue was created in 2006 by Mario Donick. Find the Book of Stars and set mankind free in story mode, or fight Eris, the evil deity, in the shorter Coffeebreak mode — the choice is yours. Click "download now" above, visit the official website and read the game guide. You can also visit the issue tracker. Story Mode is the original way to play LambdaRogue, with a large main quest in three chapters and many side quests. Embark on a long adventure to find the Book of Stars. Discover the history of Herbstwelt and redeem what is left of mankind. 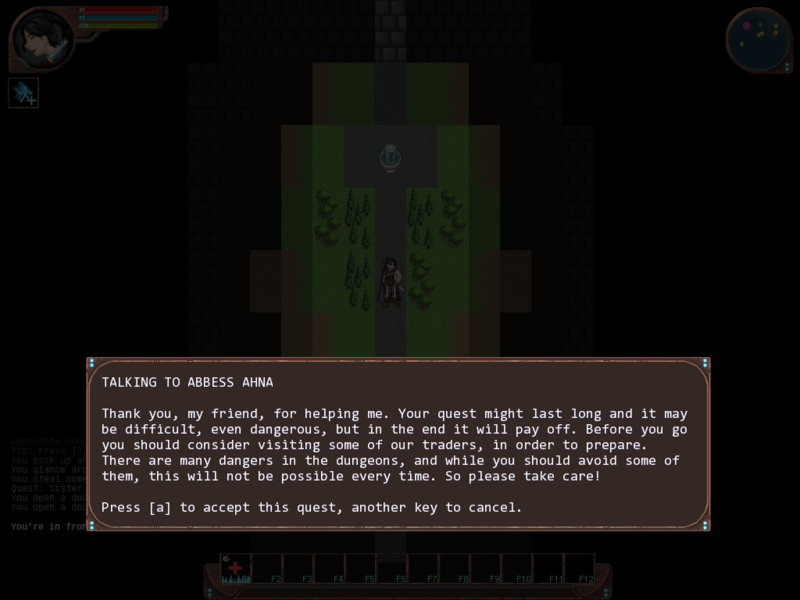 Coffeebreak Mode is a more typical roguelike experience, without story and quests, and a straightforward goal: Go down the dungeon, deeper and deeper, until you reach the Core. Defeat Eris, the evil deity, to make life peaceful again for the people. 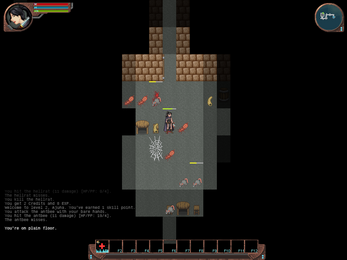 Four professions make for a varied game, every time you start, after just another stupid death or just for trying something new. Develop your talent by gaining experience (coffeebreak mode) or by fulfilling exclusive quests (story mode). Five religions add flavor to your style of play. Excercise in humility and offer sacrifices to please the gods. Invoke powerful divine rage upon your enemies. Pray to your selected god when in need. Find lots of useful items in shops and in the dungeon, to be well-prepared for what ever might lurk in the darkness of the depths. Experiment with combining items to create new ones. Disassemble items into raw materials to craft special equipment in the resource workshop. Use tools to dig through the caves to discover hidden rare items. Study and train powerful songs, to enchant your way through the everchanging dungeons. Find hidden crystals in the dungeons to learn songs you can’t study otherwise. Use magic as supporting device, or devote your entire character to the art of chanting. As Enchanter, climb the ranks of the Council: Become Battle Mage or Holy Warrior. 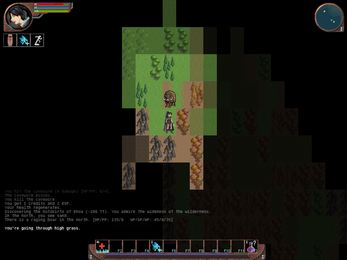 Inspired by modern games, LambdaRogue was one of the first roguelikes to show character status, mini map and message log in the corners of the screen. 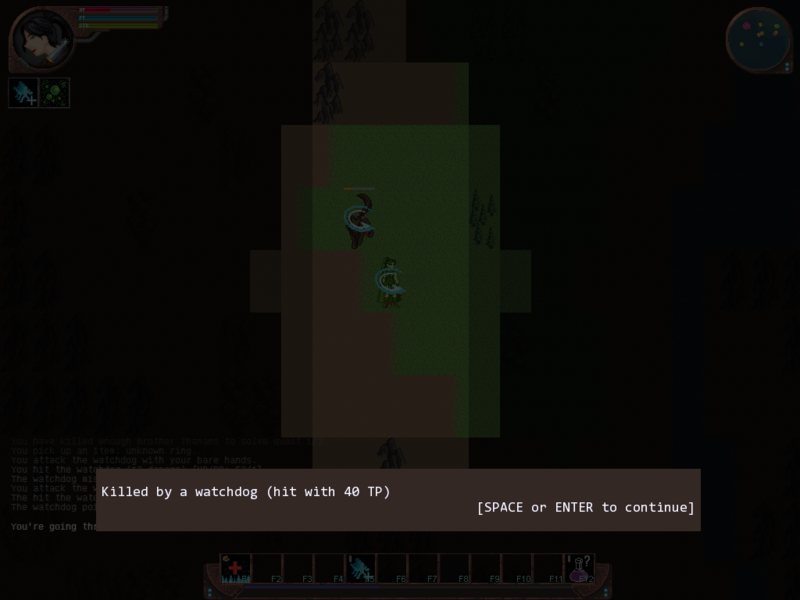 Rooted in roguelike history, LambdaRogue is decidedly not mouse-controlled, but uses the keyboard: Move with the numeric keypad, cursor keys or even Vi keys. On the bottom, there is the configurable quick bar, which gives fast access to your preferred items and magical songs. 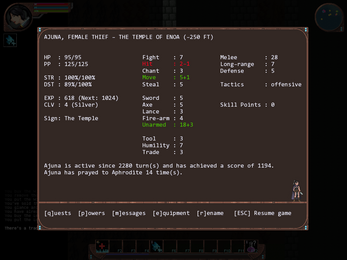 Status screen and inventory show colored hints if your status values are affect positively or negatively, or if an item is better or worse than a currently equipped one. There are only a few commands to remember. The Enter key is context aware and performs the most important actions. If needed, you can change keybindings in the in-game options to your liking — prefer WASD for movement? You can set it there. 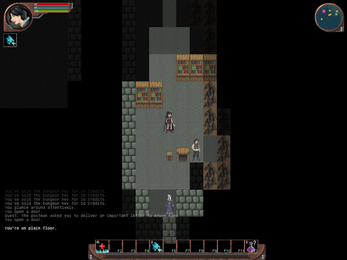 In Graphics Mode, LambdaRogue features an exclusive tileset created by Brazilian artist Cecilia Souza Santos. Zoom in and out as needed. Choose from 1920×1080, 1024×768 and 800×600 resolutions, available windowed and full screen. ASCII Mode is a true console display mode (80×25), using the Windows command line or your favorite Linux terminal. 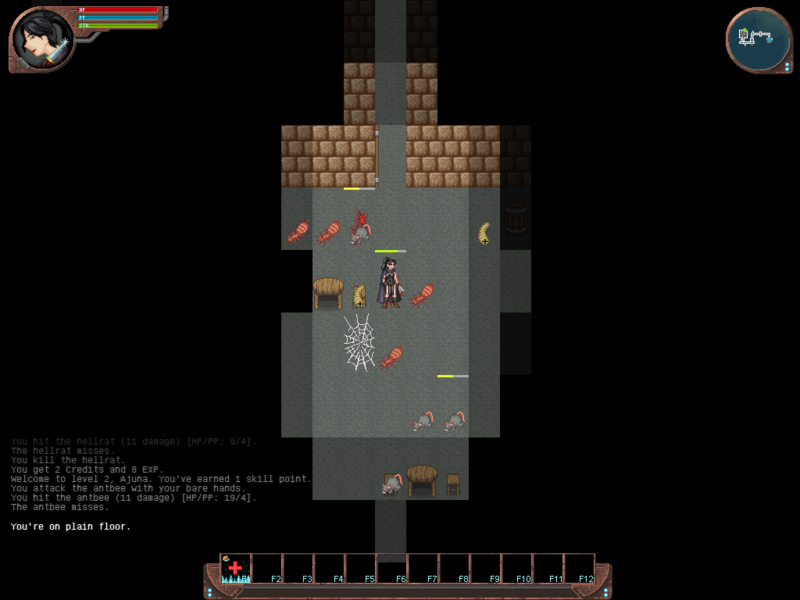 Guide your @ through hordes of enemies — this is how roguelikes are meant to be played! 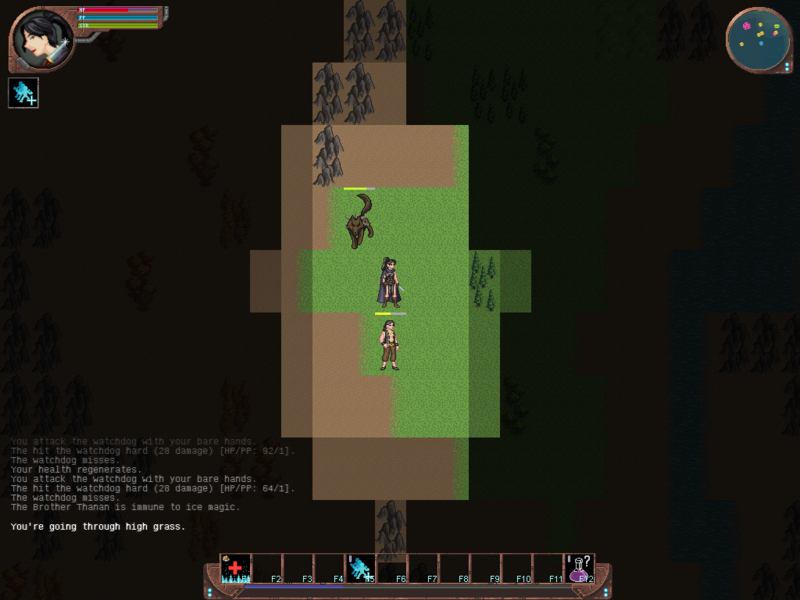 LambdaRogue: The Book of Stars is available for Linux and Windows. The game was tested on Ubuntu 18.04 and Windows 10. On Linux, the SDL v1.2 libraries have to be installed on your system. On Windows, the necessary .dll files are included. Full FreePascal source code is available (GPL v2 licensed), so it may well be possible to compile the game for other systems as well. Give it a try. Please note that previous save game are not compatible with LambdaRogue 1.7 and higher! Do not attempt to continue an old save game with the new version. This is esp. important if you used the itch.ip app for installing, as this does not delete your old saves. To delete old save games, open the LambdaRogue folder, open the "saves" folder and delete the files with the ".lambdarogue" suffix. Hello! Is it possible to reach old releases in any way? I'd like to download them for documentation purposes :) I read your devlog so I know that lots of data vanished already, but what's about later iterations? Linux / OSX build of 1.6.4 / 1.6.1? in the itch.io app you can use the "Manage" button to switch to another version, so you can install 1.6.4 there, or 1.7 later, and switch back and forth. Just note that savegames are not compatible. Much older builds (up to 1.5.1) still exist in the Google Code Archive (https://code.google.com/archive/p/lambdarogue/downloads) although I requested Google to delete that page, to avoid confusion. The last MacOS LambdaRogue build from 2013 is available here: https://sourceforge.net/projects/mac-lambdarogue/ Please note I can't support MacOS anymore, because I don't have access to a Mac anymore. My main focus is on Linux and (secondary) Windows. Lack of support for Mac doesn't bother me - as I wrote, it's for archiving purposes. 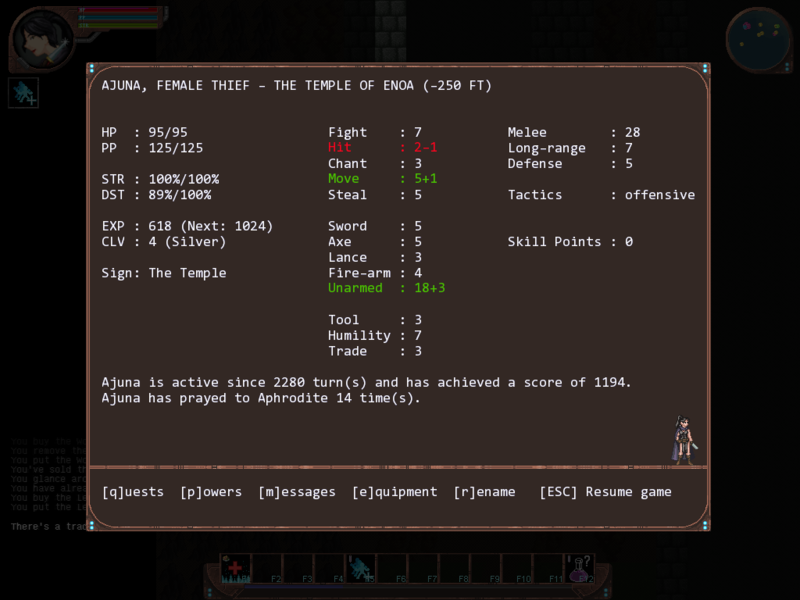 I'm just trying to save as much roguelikes as possible, including every released version.